Salmon, ocean fish meal, sweet potatoes, peas, potatoes, canola oil, pea protein, tomato pomace, smoked salmon, salmon meal, natural flavor, salmon oil (a source of DHA), salt, choline chloride, taurine, dried chicory root, yucca schidigera extract, tomatoes, blueberries, raspberries, dried Lactobacillus plantarum fermentation product, dried Bacillus subtilis fermentation product, dried Lactobacillus acidophilus fermentation product, dried Enterococcus faecium fermentation product, dried Bifidobacterium animalis fermentation product, vitamin E supplement, iron proteinate, zinc proteinate, copper proteinate, ferrous sulfate, zinc sulfate, copper sulfate, potassium iodide, thiamine mononitrate (vitamin B1), manganese proteinate, manganous oxide, ascorbic acid, vitamin A supplement, biotin, niacin, calcium pantothenate, manganese sulfate, sodium selenite, pyridoxine hydrochloride (vitamin B6), vitamin B12 supplement, riboflavin (vitamin B2), vitamin D supplement, folic acid. 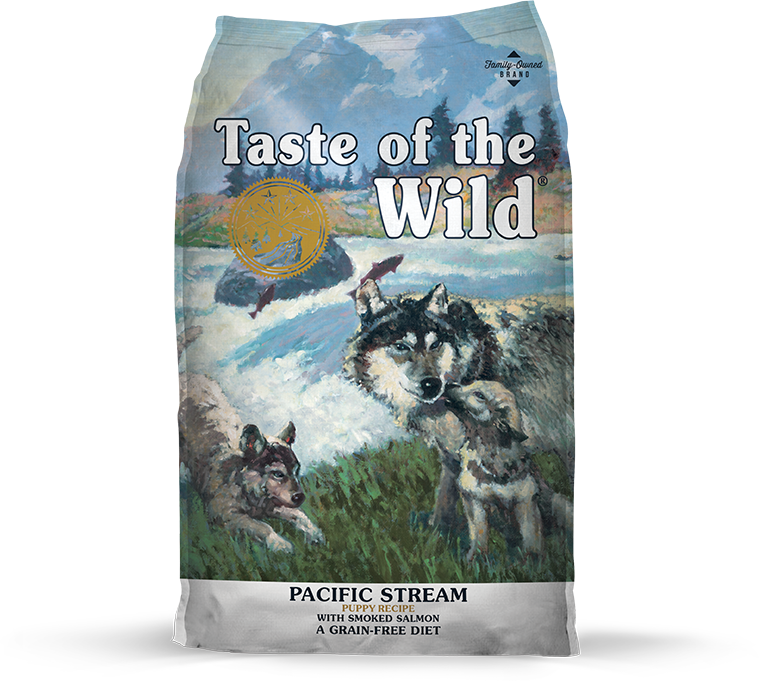 Taste of the Wild Pacific Stream Puppy Recipe is formulated to meet the nutritional levels established by the AAFCO Dog Food Nutrient Profiles for All Life Stages including growth of large size dogs (70 lbs. or more as an adult). Pacific Stream Puppy® Formula with Smoked Salmon is rated 4.8 out of 5 by 30. Rated 5 out of 5 by Marcothelab from Really pleased with this food First food our lab was able to have without suffering from diarrhea and some vomiting. After visiting 2 different vets and an emergency trip to the vet and switching dog food brands multiple times due to vet recommendations I decided to try this food as it was grain free. Immediately eliminated his issues. The vet wanted us to switch to a different foot but I'm glad I tried this one at half the price of the Rx food. Food is still a little pricey but worth not getting up 4-5 times a night to take him out. Just wish it was available in my area in 30lb bags as I can only find it at one retailer and only in 15 lb bags so Chewy to the rescue. Rated 5 out of 5 by mj1127 from Great results and he loves it I switched my now almost 9 month old lab/golden mix puppy to Taste of the Wild Pacific Stream Puppy Formula from a chicken based food a couple of months ago because of some digestive issues and itchy ears. Both problems seem to have cleared up nicely. Also, while he clearly did not love his last food, he gobbles this food down happily. His coat is super shiny, and he is growing appropriately for his age. We have been so happy with Taste of the Wild that we plan to transition him to Pacific Stream Canine Formula when the time comes. Rated 5 out of 5 by Ticky2 from Our lab and poodle love it! We started our lab out on pacific stream after I researched out no grain foods and found this to be one of the best and at a reasonable price compared to other top brands. He was doing great on it but our vet wanted us to change food to something with some grains because she felt he was gaining too much weight. Well he became very gassy and would get sick once in a while so after 6 months we switched back to the pacific stream and never looked back. Needless to say we have a different vet and now a standard poodle and both are doing great with this food. I would definitely recommend it to anyone looking for a top quality food for their pets. Rated 5 out of 5 by JodiB from My Lab puppy LOVES it! My puppy Kubota loves this food!!! He's almost 10 months old, still has a very soft coat, shiny, no skin or ear issues. 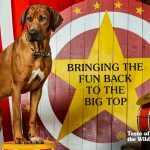 Very happy with this product and will continue him on Taste Of The Wild as an adult dog. Rated 5 out of 5 by Bella Mia from My dog loves this food! My dog has food allergies and we tried a bunch of other foods - top name brands, and nothing changed - then we discovered Taste of the Wild and after a few weeks he was back to normal, no itching and now after a couple of months on it all his hair has grown back in. Rated 5 out of 5 by Piper from Great food! I have a 9 month old puppy. We adopted her when she was about 14 weeks old. She's had all sorts of digestive issues since we brought her home. She had a large tapeworm when we got her and needed three rounds of meds to get rid of it. We weren't sure if it was that or food sensitivities that were giving her digestive trouble. Gas, loose stools and occasional vomiting... all the time. We tried multiple food brands, probiotics, pumpkin supplements... anything new we tried didn't work or made things worse. I picked up a small bag of Pacific Stream on a whim, since we haven't tried a fish-based food yet. Literally perfect stool the next day. Seamless transition period. She loves it and is FINALLY thriving. This is a great food. I highly recommend if you suspect your puppy has food sensitivities! 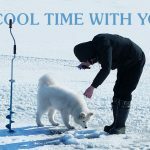 Rated 5 out of 5 by Knox from My dalmatian LOVES this When trying to find a brand of food to feed our dalmatian, we spent A LOT of time researching to ensure that his food is low in purines but maintained a high protein source. Not only is Taste of the Wild all natural, our little guy LOVES it. I can't say how happy we are with this brand/food. How many cups of dry food is in a 15 lb. bag? Thank you! Hello, the number of cups per bag varies slightly, depending on the formula. A 15-pound bag of Pacific Stream Puppy formula contains approximately 68 cups. What is the Calcium Phosphorous ratio? Hi Ruth, thanks for your question. Our Pacific Stream Puppy formula contains 1.3% calcium and 1.0% phosphorus on an as-fed basis. Hi, Kristen. We have not had any reports of this food affecting the odor of pets&rsquo; urine. Eating salmon has been associated with a change in urine odor in humans, but this hasn&rsquo;t been studied in pets. Abnormal smelling urine can be a symptom of a urinary tract infection. 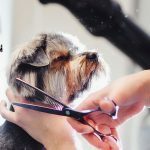 We recommend consulting with your veterinarian to determine the cause of the odor. Hi, Heather. We use a blend of sweet potatoes, peas and potatoes as the carbohydrate sources in this diet. These are nutritious foods that provide excellent nutrition for dogs. We have not done glycemic index studies on the Taste of the Wild pet foods. Is the weight on the feeding guide the current weight or the weight they&rsquo;ll be when full grown? Hello and thanks for your question! Our feeding guide reflects the current weight of your pup. Our dogs eat the High Prairie Dry Dog Food. Recently one developed a renal stone which was 85% magnesium (struvite) and 15% calcium phosphate. The vet indicated we may need to change their diet. Which of your products would you recommend to change? Hi Robert - we are sorry to hear about your dog&rsquo;s stone! Your dog may need a prescription diet to help eliminate or prevent future stones. We recommend you work with your veterinarian to find the most appropriate diet. How many cups are in a 30 lb taste of the wild adult salmon pacific formula? Hi, Wendy. There are approximately 137 cups in a 30-pound bag. Would this be appropriate for a large or giant breed puppy? I have an italian mastiff who is 4.5 months old. We read that his food should be lower in calcium, phosphorus, fat and vitamin D, but I'm not sure what the ratios should actually be. Thanks! Chloe12, Pacific Stream Puppy is a great choice for your Italian Mastiff puppy. Our puppy formulas were developed to support optimal health and well-being for growing puppies, including large and giant breeds.